"Booted from the Alamo, the Daughters of the Republic of Texas kept treasured library" was first published by The Texas Tribune, a nonprofit, nonpartisan media organization that informs Texans — and engages with them — about public policy, politics, government and statewide issues. SAN ANTONIO — When the state fired the Daughters of the Republic of Texas as caretakers of the Alamo in 2015, the women's group fought — and won — the right to keep a piece of the shrine that they considered sacred: an archive collection of 38,000 photographs, artworks, maps and manuscripts prized by Texas historians. Now, after keeping the archives in storage for a year, the Daughters have settled their library into a new home just as San Antonio prepares to highlight the city's history for its 300th anniversary in 2018. The Daughters of the Republic of Texas Library — which now lives at the Presidio Gallery in the Bexar County Archives Building downtown — includes everything from a map of the Austin colony hand-drawn by Stephen F. Austin to family documents and architectural blueprints about San Antonio's people and buildings. “It brings San Antonio back to what it used to be, what it used to look like, how it used to feel, almost what it used to smell like, there’s so much personality,” Barbara Stevens, the organization's president, said. “When you look at the archives, it tells the story of early Texas, which is our mission and goal in life as the Daughters of the Republic of Texas." To become a member of the Daughters of the Republic of Texas, women must prove they had ancestors in Texas prior to its annexation by the United States in 1845. Since the founding of the Daughters of the Republic of Texas in 1891, it has grown to include 7,000 members and 106 chapters in Texas and across the country. Brittany Eck, a spokeswoman for Bush, said she hopes the Alamo museum and the Daughters' new library could collaborate on future exhibits. "The new library is almost three times the size that was available to them on the Alamo complex, and I think many people are happy that it's in a much larger space, particularly because of its magnitude of 38,000 items," Eck said. 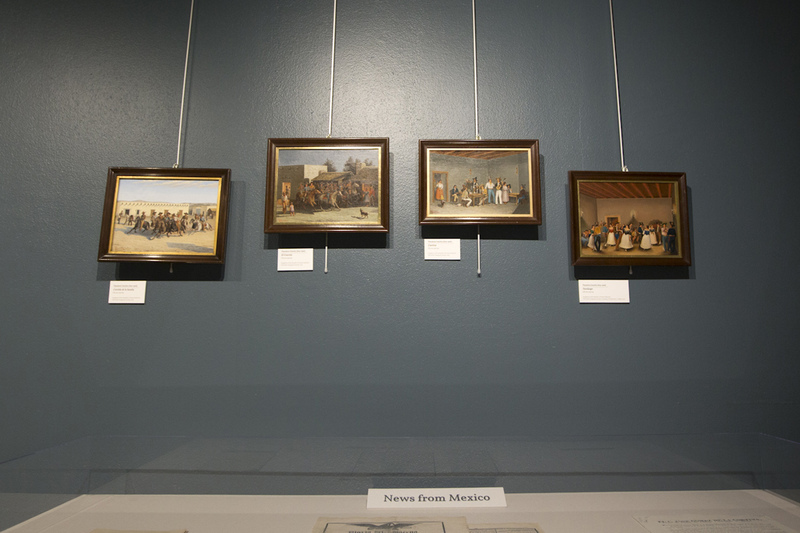 The new space in the Presidio Gallery of the Bexar County Archives Building was secured in a partnership with Bexar County and Texas A&M University-San Antonio. The building already houses county and university archives. The Daughters' collection — which is managed by a longtime employee of the group, Leslie Stapleton, shares a floor with the county archives and also includes a basement vault. Stevens said the Daughters hope San Antonio's tricentennial celebration will bring new interest to the collection, which includes Samuel Maverick's copy of the signed Texas Declaration of Independence and paintings by Theodore Gentilz. The San Antonio artist is known for capturing the lives of Mexican San Antonians in the 1800s with depictions of their homes and parties. Stevens said the archive's rare artwork, the letters between family members and lovers, and the architectural papers paint a clear picture of the lives that used to make up San Antonio. Erika Arredondo-Haskins, a historian and member of the Daughters, can trace her family back to Domingo Bustillo, an early San Antonio mayor and a prominent political and military figure toward the end of Spanish rule and through the Republic of Texas. Arredondo-Haskins, former executive director of the Hispanic Heritage Center of Texas, said the Daughters' collection has records of the Tejano families, such as her own, who have had major roles in state and local history. In her research, she seeks to highlight “untold contributions” of individuals who’ve had roles in developing San Antonio into what it is today. “When a student or person, such as myself, finds out about our ancestors that have accomplished such and such, it instills such a sense of pride,” Arredondo-Haskins said. Aside from her work writing the story of her Bustillo family ancestry, she’s researched Esther Perez Carvajal, after whom San Antonio's Carvajal Early Childhood Education Center is named. Carvajal, a descendent of one of the original Spanish colonizers in San Antonio, advanced bilingual education in the early 1900s, authoring the first bilingual textbooks used at San Antonio ISD, where she led the Spanish department. “I could not believe how forgotten this woman was," Arredondo-Haskins said. In San Antonio, the names of many streets — and schools, parks and buildings — have histories that can be traced back to sources in the Daughters' collection. Bexar County Judge Nelson Wolff has had an interest in restoring San Antonio history since his time as mayor in the 1990s, when the city restored San Antonio City Hall. "People will have access to a lot of history, research and documents in close proximity and we're very happy to have them there," Wolff said. Projects such as historic building restorations often bring architects to the Daughters' library, Stapleton said. An architect recently came in to look at photos of an old home before planning repairs. Maria Pfeiffer has used the Daughters' collection extensively during her career as a researcher and consultant for the city of San Antonio, the San Antonio Conservation Society and other organizations. Her consulting work often involves researching San Antonio-area buildings and neighborhoods. “For every project I work on, DRT is certainly one source that I always go to," Pfeiffer said of the Daughters of the Republic of Texas. For example, she has found essential records about the Alamo Plaza as well as documents about her own ancestry. Cynthia Matson, president of Texas A&M University-San Antonio, said having the Daughters' collection downtown is important to the public and will also be a key source for historians at the university, which will celebrate its 10th anniversary in 2019. “This particular partnership and arrangement with Presidio Gallery downtown is part of our evolution and growth, and adds significantly to our academic presence and research capacity, capabilities in the city of San Antonio and in the great state of Texas,” Matson said. By collaborating with the county and A&M, the Daughters hope to create opportunities for students to develop an interest in history. For example, Stapleton said students have been fascinated by the library's display of dance cards — party song lists — from San Antonio balls in the 1880s. Boys would sign next to a song on a girl's card to request a dance. The Daughters' hope is that the larger San Antonio and Texas communities take interest in the untold stories hidden in the files at the library. Back when the collection was at the Alamo, Stapleton said, visitors in town for a convention would wander over to the Alamo and ask to find out more about their family history. She hopes visitors to downtown San Antonio will wander to the collection at Presidio Gallery for the same reason. Booted from the Alamo, the Daughters of the Republic of Texas kept treasured library By Alex Arriaga January 1, 2018 SAN ANTONIO — When the state fired the Daughters of the Republic of Texas as caretakers of the Alamo in 2015, the women's group fought — and won — the right to keep a piece of the shrine that they considered sacred: an archive collection of 38,000 photographs, artworks, maps and manuscripts prized by Texas historians. Now, after keeping the archives in storage for a year, the Daughters have settled their library into a new home just as San Antonio prepares to highlight the city's history for its 300th anniversary in 2018. The Daughters of the Republic of Texas Library — which now lives at the Presidio Gallery in the Bexar County Archives Building downtown — includes everything from a map of the Austin colony hand-drawn by Stephen F. Austin to family documents and architectural blueprints about San Antonio's people and buildings. “It brings San Antonio back to what it used to be, what it used to look like, how it used to feel, almost what it used to smell like, there’s so much personality,” Barbara Stevens, the organization's president, said. “When you look at the archives, it tells the story of early Texas, which is our mission and goal in life as the Daughters of the Republic of Texas." To become a member of the Daughters of the Republic of Texas, women must prove they had ancestors in Texas prior to its annexation by the United States in 1845. Since the founding of the Daughters of the Republic of Texas in 1891, it has grown to include 7,000 members and 106 chapters in Texas and across the country. The state granted the Daughters custodianship of the Alamo in 1905 after they advocated for the rescue of the decaying site, and its members developed the mission into a tourist site. Texas Land Commissioner George P. Bush, whose agency was given Alamo custodianship in 2011, took away the Daughters' caretaker role after the state attorney general's office found in an investigation that the group neglected maintenance at the mission and misused funds. (The Daughters called the report "outrageously inaccurate" and successfully sued the state for ownership rights of the archive.) Brittany Eck, a spokeswoman for Bush, said she hopes the Alamo museum and the Daughters' new library could collaborate on future exhibits. "The new library is almost three times the size that was available to them on the Alamo complex, and I think many people are happy that it's in a much larger space, particularly because of its magnitude of 38,000 items," Eck said. The new space in the Presidio Gallery of the Bexar County Archives Building was secured in a partnership with Bexar County and Texas A&M; University-San Antonio. The building already houses county and university archives. The Daughters' collection — which is managed by a longtime employee of the group, Leslie Stapleton, shares a floor with the county archives and also includes a basement vault. Stevens said the Daughters hope San Antonio's tricentennial celebration will bring new interest to the collection, which includes Samuel Maverick's copy of the signed Texas Declaration of Independence and paintings by Theodore Gentilz. The San Antonio artist is known for capturing the lives of Mexican San Antonians in the 1800s with depictions of their homes and parties. Stevens said the archive's rare artwork, the letters between family members and lovers, and the architectural papers paint a clear picture of the lives that used to make up San Antonio. “The collection would have fit in at any of the universities,” Stapleton said. “It needed to stay in San Antonio and not go to Austin because it’s so San Antonio strong.” Scenes of early San Antonio painted by Theodore Gentilz hang on display in the Daughters of the Republic of Texas' new library. Marjorie Kamys Cotera for The Texas Tribune Erika Arredondo-Haskins, a historian and member of the Daughters, can trace her family back to Domingo Bustillo, an early San Antonio mayor and a prominent political and military figure toward the end of Spanish rule and through the Republic of Texas. Arredondo-Haskins, former executive director of the Hispanic Heritage Center of Texas, said the Daughters' collection has records of the Tejano families, such as her own, who have had major roles in state and local history. In her research, she seeks to highlight “untold contributions” of individuals who’ve had roles in developing San Antonio into what it is today. “When a student or person, such as myself, finds out about our ancestors that have accomplished such and such, it instills such a sense of pride,” Arredondo-Haskins said. Aside from her work writing the story of her Bustillo family ancestry, she’s researched Esther Perez Carvajal, after whom San Antonio's Carvajal Early Childhood Education Center is named. Carvajal, a descendent of one of the original Spanish colonizers in San Antonio, advanced bilingual education in the early 1900s, authoring the first bilingual textbooks used at San Antonio ISD, where she led the Spanish department. “I could not believe how forgotten this woman was," Arredondo-Haskins said. Mapping San Antonio history In San Antonio, the names of many streets — and schools, parks and buildings — have histories that can be traced back to sources in the Daughters' collection. Bexar County Judge Nelson Wolff has had an interest in restoring San Antonio history since his time as mayor in the 1990s, when the city restored San Antonio City Hall. "People will have access to a lot of history, research and documents in close proximity and we're very happy to have them there," Wolff said. Projects such as historic building restorations often bring architects to the Daughters' library, Stapleton said. An architect recently came in to look at photos of an old home before planning repairs. Maria Pfeiffer has used the Daughters' collection extensively during her career as a researcher and consultant for the city of San Antonio, the San Antonio Conservation Society and other organizations. Her consulting work often involves researching San Antonio-area buildings and neighborhoods. “For every project I work on, DRT is certainly one source that I always go to," Pfeiffer said of the Daughters of the Republic of Texas. For example, she has found essential records about the Alamo Plaza as well as documents about her own ancestry. 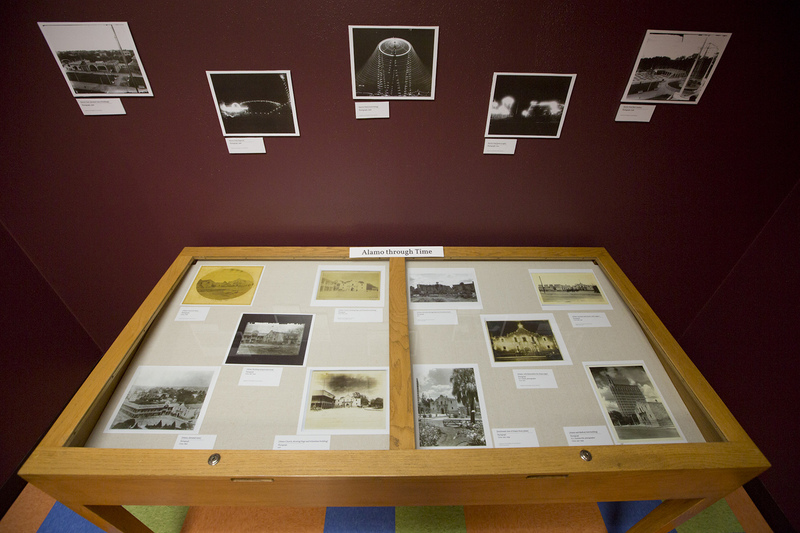 An exhibit in the Daughters of the Republic of Texas Library shows the Alamo through time. Marjorie Kamys Cotera for The Texas Tribune A new partnership Cynthia Matson, president of Texas A&M; University-San Antonio, said having the Daughters' collection downtown is important to the public and will also be a key source for historians at the university, which will celebrate its 10th anniversary in 2019.&nbsp; “This particular partnership and arrangement with Presidio Gallery downtown is part of our evolution and growth, and adds significantly to our academic presence and research capacity, capabilities in the city of San Antonio and in the great state of Texas,” Matson said. By collaborating with the county and A&M;, the Daughters hope to create opportunities for students to develop an interest in history. &nbsp; For example, Stapleton said students have been fascinated by the library's display of dance cards — party song lists — from San Antonio balls in the 1880s. Boys would sign next to a song on a girl's card to request a dance. The Daughters' hope is that the larger San Antonio and Texas communities take interest in the untold stories hidden in the files at the library. Back when the collection was at the Alamo, Stapleton said, visitors in town for a convention would wander over to the Alamo and ask to find out more about their family history. She hopes visitors to downtown San Antonio will wander to the collection at Presidio Gallery for the same reason. “We’d narrow it down for them and help them figure it out, and if they found out they were related to one of the defenders then all of a sudden they were all about Texas history,” Stapleton said. “If you can make it real for them, the history comes alive.” Read related Tribune coverage Daughters of the Republic of Texas Sue Land Office Texas lawmakers battle with Land Office over transparency in Alamo restoration "Booted from the Alamo, the Daughters of the Republic of Texas kept treasured library" was first published at by The Texas Tribune, a nonprofit, nonpartisan media organization that informs Texans — and engages with them — about public policy, politics, government and statewide issues. Link back to the original article, which is located at https://www.texastribune.org/2018/01/01/san-antonio-celebrates-its-300th-anniversary-long-history-told-through/.